Aside from the intuitive interface and the stylish build, iOS devices are known for getting the best apps before other operating systems. But Facebook has strangely lacked an official presence on Apple's iPad. Thankfully, the New York Times reports that we should see an official Facebook app for the iPad in the near future. Apparently, production has been underway for almost a year, optimizing the experience for tablets. And they are now in the final stages of testing. The anonymous source told the Times that Mark Zuckerberg has been working closely on the project, overseeing the unique features. That source also says that the Chat and Groups interfaces have been completely reworked for the app. Similar to the upcoming app for the iPhone, the iPad app will be capable of uploading pictures directly from the iPad's cameras: "The photo and video experience is amazing, offering full resolution and full-screen images." Given Facebook's popularity, this app could extend the advantage that the iPad has over its Android competitors. What do you think? 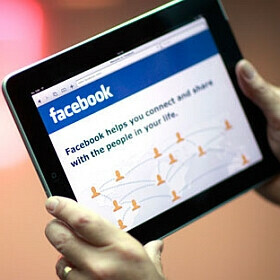 Will a superfly iPad Facebook app affect your purchasing behavior? well one app won't make me spend 500+ dollars but the consistent quality in apps that IOS has and Android lacks definitely plays a part. This just being an example. I'm also starting to notice that aside from games and first party apps wp7 apps lack the quality if IOS. They have the polish but lack the quality, staying somewhere in between ios and Android. For many years I have avoided Apple because of their closed system. I finally broke down and bought an Ipad 2. Wow. IOS is getting more impressive everyday backed up by a well built product=WIN ME OVER.